Of the new house and grounds. Mel has requested to see more pictures. We or should I say Alan has had a busy weekend. It was his birthday on Saturday and he had a lovely (tongue in cheek) day painting what used to be the Colours Down Under stock room and also did the main WC (which is short for water closet or toilet). We now have the front hallway, 3 bedrooms, the back hallway, the main bathroom and the main toilet finished. We still have numerous door frames and doors and 2 bedrooms and 3 living areas to paint and then a big presentation clean up and we can finally put the house on the market. Pheww will we ever get there. After this post I need to get back to packing. 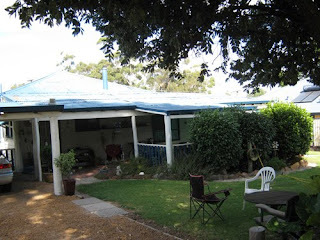 This is some of the back yard. 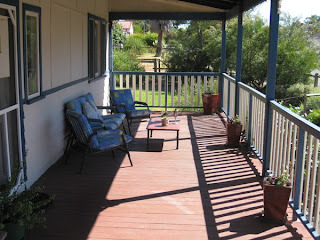 This is the front verandah. That's a nice house I guess. We are putting in a porch swing, right? Janine, I'm so happy for you. Glad that Anthony is settled at uni! The house looks charming & the area sounds lovely. Much cooler than perth is also a good thing!! Love the house! And the yard looks like it will provide lots of fun for kids/grandkids when they arrive! !